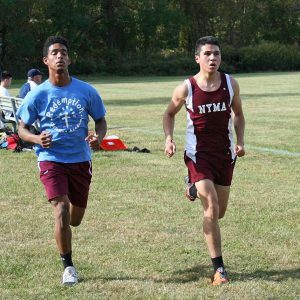 Saturday at Homecoming, NYMA hosted Storm King, Darrow, and Redemption Christian Academy for our Cross Country Invitational. It was a beautiful October day to run and enjoy the scenic Hudson Valley. Sophomore Matthew Montes finished 3rd. Freshmen Daniel Geng and Michael Zelenger also earned medals coming in the top-seven among freshmen runners. This past Wednesday, October 25th, the Knights traveled to Marvelwood for their invitational and Cadet Montes finished in 4th place. Eighth-grader Daniel Geng also ran a great race and set a personal record by two whole minutes.